This rich collection was initially published in 2014 by the International Institute for Research and Education (IIRE), which opened in Amsterdam in 1982. One of the founding Fellows of IIRE was Ernest Mandel. The book is edited by Sara R. Farris, who teaches sociology at Goldsmiths College, University of London. The 20 chapters in the volume (including the Introduction) are all revised texts of papers presented during a two year seminar series at IIRE between 2007 and 2009, and a number of them are revised versions of earlier publications. The readers is therefore offered a series of insights into the state of Marxist theory some 10 years ago. Nonetheless, this reasonably priced collection is highly recommended, and contains, together with some oddly short chapters, some real gems. 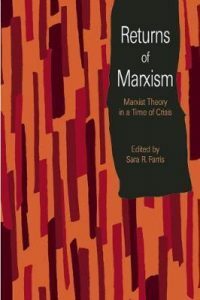 The texts are divided into six different sections, with the aim of proposing, according to the editor, “a path for reading them as contributions to broader significant problematics within the Marxist tradition” (7). The sections have impressively diverse headings: Reading Capital (five chapters); Re-Reading Marx (three chapters); Marxism and International Politics (three chapters); Historicising Historical Materialism (three chapters); Feminism and Queer Marxisms (two chapters); and Many Marxisms (three chapters) – and an Introduction by Sara R. Farris. For this reviewer a high point of the collection is the chapter by Michael Heinrich, “A Short History of Marx’s Economic Critique” (63-86). This is an excellent translation into English of a revised version of Heinrich’s 2009 “Theoriegeschichte der Marxschen Ökonomiekritik” in the collection Hello Marx: Zwischen “Arbeiterfrage” und sozialer Bewegung heute (Peter Bedcherer and Karen Schierhorn (eds), Hamburg: VSA Verlag). The title is rather deceptively modest for what is a lucid and bracing introduction to Heinrich’s central message: that Marx was categorically opposed to the assumption that he had established a “socialist system”. As Heinrich insists, “Above all, there are no texts to be found that show directly or indirectly that he wanted to build any kind -ism.” (66). Later in the article Heinrich explains that rather than a single consistent oeuvre, or, as for Althusser, a simple break between a younger, more philosophical Marx and a later focus on political economy, “we find in Marx a whole series of attempts, discontinuations, shifts, new concepts and new beginnings.” (72). Heinrich concludes by declaring that “Marx did not expect people to take action against capitalism on moral grounds, but because of the fact that their immediate vital interests are constantly put into question. When people repeatedly resist those relationships, however, they will learn to fight, not only for an immediate improvement in their situation under capitalism, but also, from time to time, to challenge the very existence of capitalism as such. Marx’s Capital is quite helpful in those struggles. It may well turn out, as a self-confident Marx once claimed, to be “the most terrible missile that has yet been hurled at the heads of the bourgeoisie (landowners included).” (80-81, quoting Marx to Becker 17 April 1867, MECW vol. 42, p. 358). At the conference “Capital.150: Marx’s Capital Today” held in London on 20 September 2017, Heinrich’s topic was “Communism in Marx’s Capital”, and is available at https://youtu.be/cZSccinSMp8. This is well worth watching especially as he was speaking on a panel with three great young female Marx scholars, Tithi Bhattacharya on “Social reproduction theory: conceiving capital as social relation”; Lucia Pradella on “Marx’s Capital and the power of labour: imperialism, migration, and workers’ struggles”; and Beverly Silver on “Marx’s general law of capital accumulation and the making and remaking of the global reserve army of labour” – all on the same YouTube video. When he was asked by a participant whether he could sum up Marx’s lifetime of research and writing in one word, Heinrich replied “Struggle!” This reviewer agrees. It is now abundantly clear, as Heinrich insists, that there is no predetermined end of capitalism, but struggle is an open-ended process – “much is possible but nothing is for sure” (81). Another chapter which caught this reviewer’s close attention is “Towards a Critical Political Economy of European Governance”, by Jan Drahokoupil, Bastiaan van Apeldoorn, and Laura Horn, from Germany, Netherlands and Denmark (193-213). This is a revised version of their Introduction to their edited volume on neoliberal governance in the European Union, Contradictions and Limits of Neoliberal European Governance: From Lisbon to Lisbon (Palgrave Macmillan, 2008). The revision has left in place a number of rather tantalising references to chapters in their collection, referred to, confusingly, as “this volume” ( 207, 208, 209). Of particular interest to this reviewer is the fact that the authors mobilise a “critical realist perspective” for their critical political economy, drawing on Roy Bhaskar’s explosive 1979 The Possibility of Naturalism and Margaret Archer’s 1995 Realist Social Theory, as well as Hubert Buch-Hansen’s 2006 paper “Beyond rationalism and constructivism: a critical realist intervention in EU studies”, delivered at the ESA Critical Political Economy Workshop in Amsterdam, the “Amsterdam Project”. They stress “the dialectical interplay of structure and agency over time in which agency is never pre-social but always operating within the bounds of given social structures while the latter are at the same time dependent upon (individual, collective, strategic or less strategic) human agency for their reproduction or transformation.” (199) Furthermore, the authors start from the idea that (social) reality is stratified, “and that therefore we need research strategies that are able to probe at the deeper levels of non-observable but real structures that account for what we observe empirically.” This methodology, which Marx described as “science”, was, as the authors point out, developed in Andrew Sayer’s 1992 Method in Social Science: A Realist Approach. The 1971 edition of Antonio Gramsci’s Prison Notebooks also provides a rich source of development in the authors’ illuminating if brief analysis of the nature of the EU and its institutions. Elsewhere, Carchedi’s chapter, mentioned above, proposes a reading of the theory of value as the necessary framework to articulate a theory of subjectivity and knowledge production, a Marxist theory of knowledge as the condition of possibility for a theory of crises. Bellofiore’s chapter, on the other hand, exotically entitled “Chrysalis and Butterfly, Ghost and Vampire: Marx’s Capital as the ‘Gothic critical economy of zombie capitalism,” (41-62, with no references), attempts to assess the nature of contemporary capitalism in terms of ‘centralisation’ without ‘concentration’, whereby financial capital is increasingly central to valorisation and workers’ organisation and struggles are made more difficult by the schizophrenic emergence of the labourer as a ‘traumatised’ worker, a ‘manic-depressive’ saver and an ‘indebted’ consumer. Finally, this is indeed a rich collection, to be acquired and savoured.